Children's Entertainer and Magician, Andy's two hour party packaage includes a high-energy disco filled with dancing, action songs and great fun games that children of all ages will love.This very popular package that most parents book for their birthday party is a great value for money entertainment package. 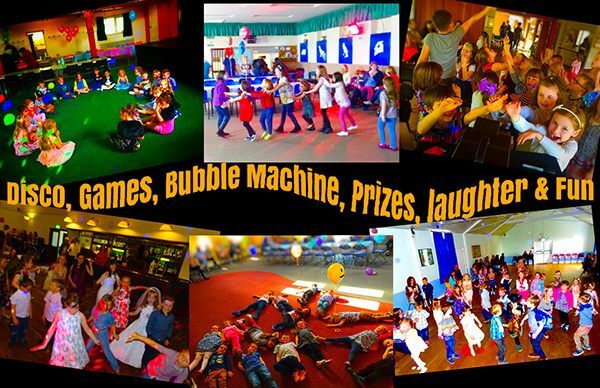 The 2 hour package combines the "The Children's Disco", "Balloon Animals", "Magic Show" and "The One Hour Party Package" and is guaranteed to make your party magical and hassle free and fun-packed. Up-to-date music including: Gangham Style, Uptown Funk, All About the base and songs from "Frozen" and "Trolls"
All the above will last for approximately forty-five minutes. A thirty-minute break will be taken for Refreshments. Charlie the Monkey will say "Hello" to the birthday child and all their friends as they eat. Andy will get everyone singing Happy Birthday. The last forty-five minutes is Andy’s Amazing Magic Show. Including loads of great comedy and entertainment in the magic show. The birthday child / helper are invited to help Andy perform some magic. The birthday child / helper receive a special Balloon Creation. Max the Magic Dog performs his incredible trick and produces sweets for all the kids. The whole party can be rounded off with all the children receiving a balloon animal each. All you do is invite the children to the party, give them food and party bags and leave the rest to Andy.